Nag Tibba has a beautiful and unparalleled view of the Garhwal Himalaya which makes it a popular trekking destination. With this popularity comes the bane of commercialisation and the loss of solitude. Still, you would be wrong to discard Nag Tibba as one for dilettante trekkers. Inditramp explores every facet of Nag Tibba to bring you what's popular and also its unexplored coves and meadows. Whether you seek to revel in the company of others or plan your own sylvan trek, we have you covered in our comprehensive Nag Tibba coverage. Nag Tibba is named after the 'Nag Devta' or snake god, from which it borrows the first part of its name; 'Tibba' is a local word for hill or peak. Nag Tibba is easterly of three principal ranges of Lesser Himalayas - Nag Tibba, Dhauladhar, and the Pir Panjal. Nag Tibba range forms the watershed between the Ganges and Yamuna rivers in Uttarakhand. There are four trekking routes to reach Nag Tibba. One each from Devalsari, Shrikot, Patharkhol and Pantwari village. A seven-kilometre easy trekking trail from Pantwari is the most used trail to visit Nag Tibba. In this article, we share the details of this trekking trail. Besides this, we add four detours that lead to meadows unexplored yet more scenic than Nag Tibba Top. Learn more about my trekking experience at Nag Tibba in my Trek Journal (Part 1, Part 2 and Part 3). There are stories about Gaddis, their dogs and other anecdotes about Nag Tibba. Pantwari is a small village (Google Maps) with a main bazaar that stretches on both sides of State Highway 6 (SH6). SH6 connects Nainbagh (Google Maps) with Uttarkashi. Pantwari Bazaar has a dhaba, a bank Punjab National Bank with an ATM inside its premises and a few rooms-to-let. Yet, if you're on an impromptu trekking plan or if you've forgotten to carry essential trekking gear, you can rent it at Pantwari. Nagtibba Trekking & Tent Centre (Ph: 9411383379 / 9557644811) is a one-stop-shop for renting trekking gear in Pantwari. The proprietor Gambhir Chauhan will also help arrange a guide, porter, pony or kitchen should you need one. Gambhir is an exemplary, honest and caring businessman who hails from Tadwan Gaon. I've seen him give invaluable advice and lend gear to ill-prepared trekkers without seeking payment. If you are driving to Pantwari from Nainbagh, cross the bazaar and drive for another 800 metres. From here a dirt road bifurcates from the state highway and heads uphill (to your right if approaching from Nainbagh). This 3-kilometre dirt road is a dead end that leads up till Tadwan Gaon (village) and on to a parking spot that marks the beginning of Nag Tibba trek. 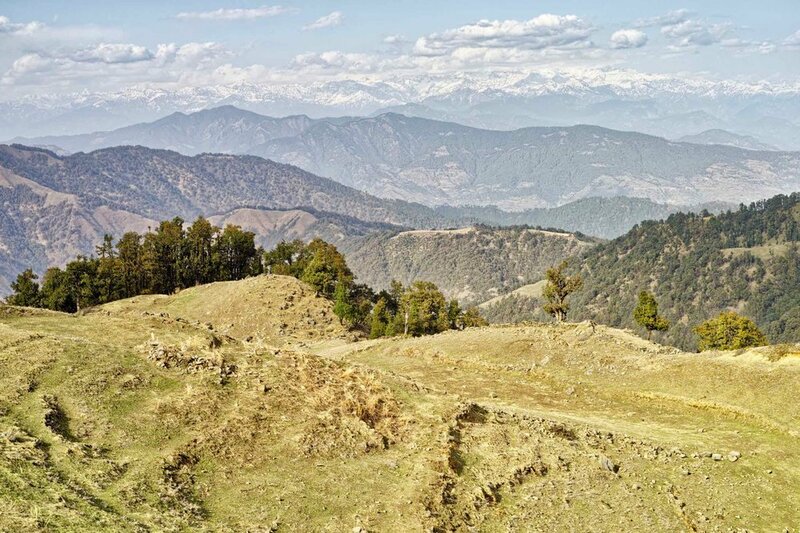 However, if you're using public transport, a walking trail from Pantwari village connects to the main Nag Tibba trekking trail, but it adds another 3 kilometres to the trekking distance. The trail to Nag Tibba from the parking spot after Tadwan Gaon is rocky, albeit well marked. From the parking spot a.k.a. starting point at 1620 m (Waypoint 001 in GPS logs) you will be climbing on to the Nag Tibba Forest Bungalow at 2635 m elevation. This is a vertical elevation gain of over one kilometre or more if you're walking from Pantwari village (1507 m). Climbing this trail, especially during the summers can be a hot and fatiguing proposition. Therefore, we recommend making an early morning start especially between the months of April to September. The first water point is 800 metres along the trail, often referred to as Naugaon Water Point (Waypoint 002). We recommend you fill up your water bottles for the trail at this point. Looking back at Pantwari from Pantwari - Nag Tibba trekking trail close to The Goat Village. It can get crowded at the base camp especially on weekends. However, if you're acclimatised and have made an early morning start, I recommend giving this camping spot a miss. While this may seem serene during the day, this camping ground can get noisy with large trekking groups later in the afternoon. From the base camp, it is a 3-kilometre walk to the Nag Tibba Forest bungalow. Thankfully, this stretch offers more shade and the weather does get a lot cooler walking under dense oak and rhododendron cover. A kilometre after the base camp there is an open space along the trail. At this point, you can choose to stay on the trail or walk along the defined trail or head north to a small secluded prospective camping ground with a water source close by (Waypoints 010 and 011 respectively). Irrespective of which route you take, both converge at the Nag Tibba Forest Bungalow. If you're taking the regular route, don't forget to stop and admire the view just before the forest bungalow when jungle drops down on both sides of the ridge and the Bandarpunch and Gangotri ranges are visible to your left. This along with Digon Thatch is one of the best places to watch the sunset as it lights up these peaks in shades of orange and pink. This 2 kilometre (1 hour) child-friendly trail brings you to Digon Thatch. The best meadow to watch the sun set over Garhwal Himalaya. Descend 200 metres north-west from Nag Tibba Forest bungalow to a small meadow with a run down Gujjar encampment. From this small meadow, a pony trail leads due East. 500 metres on this pony trail, you come to a mountain stream that is your best bet for clean potable drinking water. From the mountain stream, the path undulates gently through a dense oak forest filled with moss and mushrooms. The last 500 metres is a gentle climb onto a large meadow called Digon Thatch. With no steep unprotected sections and a gentle climb, this is a child-friendly trail. A child-friendly 1.5 kilometre (1 to 1.5 hour) ascent to the highest point on the Nag Tibba ridge. The best time to visit is early morning. From Nag Tibba Forest Bungalow a broad trail climbs due east. The climb is a bit stiff as it makes its way straight up the ridge (350 m vertical ascent) in the next 1.5 kilometres. Thankfully this trail has an excellent tree cover which makes it easier and more fun during summer. You emerge from the tree cover at the base of a small meadow at Jhandi Top. Prayer flags marking Jhandi Top can be seen to your right (due east). 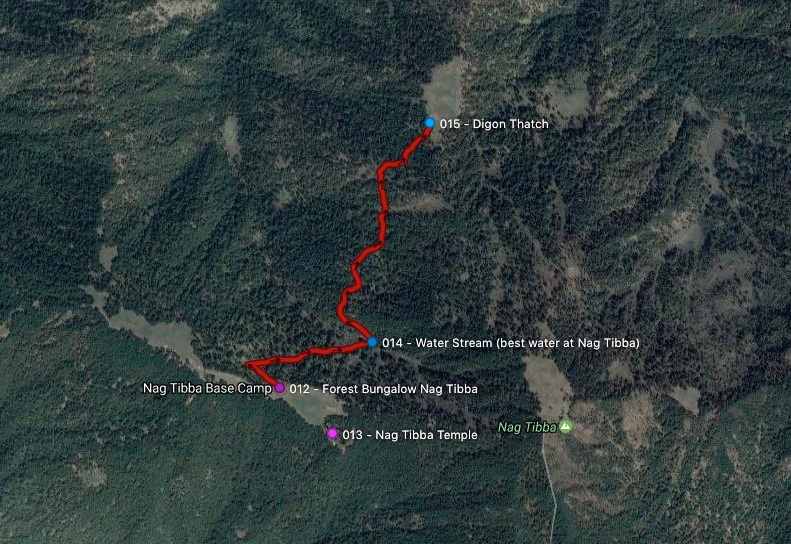 Nag Tibba Forest Bungalow to Jhandi Top (Highest point at Nag Tibba ridge) waypoints and route map. This 4 kilometre (3 to 4 hours) trail links Jhandi top with Chinyali Thatch. Chinyali is the prettiest meadow around Nag Tibba ridge with the best views. From Jhandi Top follow a faint trail due east. This trail soon ducks into an oak forest and emerges at the first meadow known as Muraltu Thatch. Muraltu is 500 metres from Jhandi Top. Keep following the pony trail east for another 500 metres. At this point, there is a bifurcation in the trail. The trail that leads to the right (uphill) leads to Techta Thatch and the one to the left leads to Chinyali Thatch. In March 2017 I was stopped by a huge snowdrift on the way to Chinyali Thatch and had to turn back to this bifurcation and make my way to Techta Thatch. From Techta Thatch I had to devise an impromptu route to Chinyali Thatch. Follow the uphill trail through the oak jungle as it ascends slowly for another 750 metres and emerges at Techta Thatch. Techta Thatch has some sublime views over huge forests and on to Thatyur and Dhanaulti. On the west end of Techta Thatch, the ground drops steeply. Just 20 metres into the descent there is a cove that is also a source of perennial water. This water source is known as "Gupt Paani" or literally hidden water since only a few goatherds know of this water source (Waypoint 025). From the north end of Techta Thatch walk along the north -south ridge keeping due north. The trail drops rapidly and there are a couple of sections that require due care. The trail is mud with some rocks for the most part and there is ample shade on this trail. Keep following the ridge for a kilometre till you come to a patch of trees that have been burnt in a forest fire or lightning strike. This is the midway point from Techta to Chinyali thatch. After this point the trail evens out and slowly undulates for another kilometre till Chinyali Thatch. Chinyali Thatch offers a conundrum for trekkers. From this meadow, you can climb down all the way to Dulleshwar Maharaj temple at Patharkhol or make your way back to Jhandi Top. Jhandi Top to Chinyali Thatch via Techta Thatch and Gupt Paani route and waypoints. Two ponds close to Nag Tibba that offer a bird's eye view over Lal Tibba and Mussoorie. It is believed that a rock face on this slope is visible all the way from Camel Back Road in Mussoorie. This two and a half kilometre trail (under one hour) is easy and child-friendly. Pantwari village, Uttarakhand (Google Maps). 29 kilometres from Nainbagh (Google Maps) and 57 kilometres from Mussoorie (Google Maps). Regular bus from Mussoorie or Dehradun till Nainbagh. Shared taxi/jeep from Nainbagh to Pantwari. Private taxis can be arranged from Dehradun or Mussoorie. Pantwari is 57 kilometres (3 hours) from Mussoorie. Nag Tibba has no accommodation except for Gujjar Tharas and the Forest Bungalow. We recommend carrying a tent. Basic rooms-to-let at Pantwari village. Prices range between 300 - 600 / night. Nainbagh has a couple of slightly better hotels with hot water. Recommended - Prem Pawani Hotel, Nainbagh (Google Maps) has well prepared homely food and basic rooms. Snow after December usually lasts until March. You will need a fleece and jacket in March and April. Summers are pleasant with day temperatures in mid-20s and night temperatures at around 5 degrees. The ridge is prone to thunderstorms and lightning strikes (Learn how to survive lightning storms in the Himalayas). Spotty connection with 2G data at Nag Tibba and the meadows nearby. Pantwari has a stable 2G connection which is in process of being upgraded to 3G (April 2017). Nainbagh has excellent 3.5G connectivity. Pantwari to Nag Tibba elevation graph. What is this? 1. Tent / Bivy sack. There is no shelter other than Gujar tharas and one forest bungalow at Nag Tibba. The forest bungalow is usually occupied by trekking operators support staff. A sleeping bag rated to 5 degrees in summer (April - November) and -10 degrees in winter (December - April). Unless you want to feel each root and rock in your back at night. Helps maintain balance especially since the trail is mud and fallen leaves for most of the route. If you are camping at Digon / Chinyali thatch you will need to carry water to drink and cook. Unless like me you plan to use snow for cooking. While Nag Tibba does offer a lot of deadwood for burning, do exercise restraint with open campfires and make sure it is completely extinguished before leaving / sleeping. To view Garhwal Himalaya up close. Fleece and windbreak jacket in summers. Base layer, fleece and feather jacket in winters. Poncho or rain jacket and overtrousers. Thunderstorms are usual at Nag Tibba. 10. Lightweight trekking / trail running shoes. Unless you're doing a winter trek you do not require heavy trekking boots for Nag Tibba. Learn why I prefer trail runners to boots.